The graffiti has been replaced by advertising. The tokens have been replaced by MetroCards. But the subway preachers are a constant. They were there before I was born and will likely be there after I die — unless, of course, their occasional prophecy of the exact date that the world will end turns out to be accurate. Some hand out leaflets quietly while others shout passages from the Bible. Some have a strict schedule; others show up whenever they are moved to do so. There seems to be little uncertainty of mission, no sign of existential angst. Most are Christian, servants of Jesus, but there is the occasional Hasidic Jew wandering the concourses. These proselytizers do not, generally, ask for much. You don’t have to give them money to buy a sandwich, and you’re not really obliged to feel guilty if you look away. If you take a tract or ask a question, you’ve gone well beyond your civic duty. Most riders ignore them. Over the past few months, I did not. OBSERVED Asking passers-by, “Are you a Jew?” on a Sunday at 1 p.m. in Times Square. BACKGROUND A Lubavitcher Hasid from Israel who was visiting Brooklyn in September for the holidays, and, “if the Moshiach” — Hebrew for Messiah — “doesn't come in the next few minutes,” planned to return to study at the movement's headquarters there. 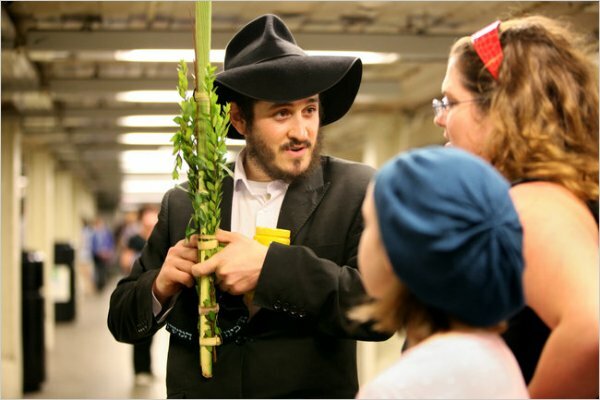 MESSAGE To help secular Jews observe holiday rituals, like shaking the lulav last month for Sukkot.